9.439 Acre Flood Irrigated Property offers 4,506 SF Main Home w/ 5 Bed + Office (Master Downstairs), 3.5 Bath, 3 Car Garage + 1,600 SF Guest Home w/ 2 Bed, 2 Baths & 2 Car Garage + 14 Stall, 5,670 SF Barn w/ touch controlled lighting, automatic water system in each stall with sensors to monitor water consumption, tack room w/ built-in saddle racks, vet stocks for grooming or interior wash rack, exterior wash rack, office & bathroom. Equestrian amenities include multiple pastures, corral & arena. Excellent Income Potential – $45,000 for Guest House & $65,000 for Horse Stalls. 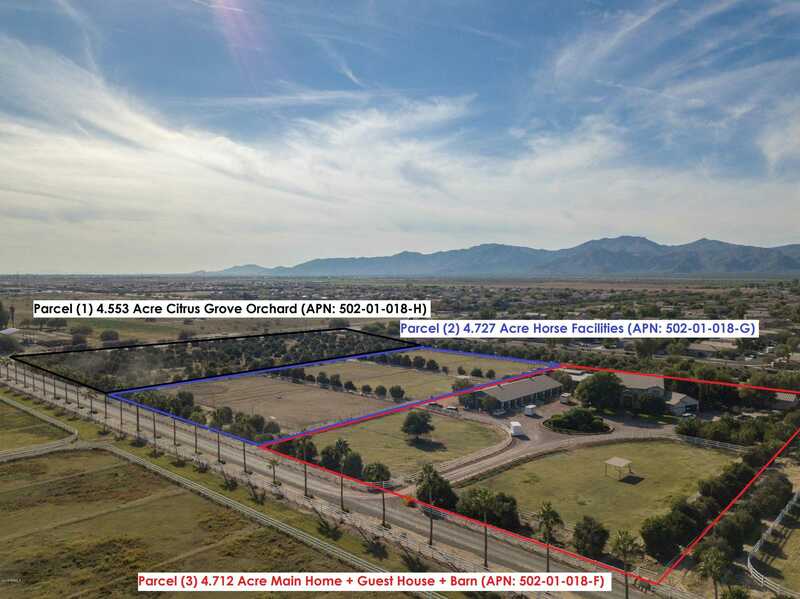 Additional 4.553 Acre Orchard Available. Owner will sell parcels individually or together and is open to creative financing for the right buyer. Directions: From Cotton Lane: West on Waddell Road. North (right) on 172nd Avenue. Equestrian Estate begins at the the northwest corner of 172nd Avenue and Waddell Road with 660 feet of frontage on Waddell Road. Full pool update in 2011. Approximate size: 411163.00 sq. ft. Please, send me more information on this property: MLS# 5860460 – $2,650,000 – 14014 N 172nd Avenue, Surprise, AZ 85388. I would like to schedule a private showing for this property: MLS# 5860460 – $2,650,000 – 14014 N 172nd Avenue, Surprise, AZ 85388.